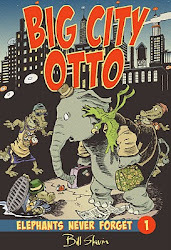 Below is a brief explanation of the art of picture book design. It doesn't deal with the writing of the book, but rather the process of illustration once the author's manuscript is in hand. And it is my own approach – other illustrators' may be quite different – although the process of character sketches, thumbnails and pencil roughs is fairly common. Computer-generated art, of course is changing some if not all of that. It may be of interest to readers that in many (if not most!) cases the author and illustrator work in isolation, with the illustrator's job beginning where the author's has left off. In most cases the collaboration does not happen on the personal level, but rather it is the collaboration of two artistic talents, with one (the illustrator) playing off and responding to the author's words. It is therefore generally the illustrator's job to determine what words go on what page and decide upon the appropriate illustrations that will convey the story. Also the illustrator is the one who creates the visual universe within which the story takes place and decides what those characters who populate the story will look like. In other words, all of the visual part of the story-telling! This is generally established before I begin my work. Most commonly a picture book will be 32 pages in length – less commonly 40 or 24. Regardless the number of pages is always in multiples of eight because books are published in eight page “signatures” (see image below). In fact it is helpful as an illustrator to have some understanding of the process of book printing, as their art will have to be adapted to this. Here is a double page spread that I did in my book Transformed: How Everyday Things are Made which deals with the basics, including the nature of “signatures”. This is a spread from my book Transformed: How Everday Things are Made. Double click on the image to se it larger. On receiving the manuscript, my first task is to determine page breaks. I generally do this by reading through the manuscript and making ticks in the margin where I believe an image can effectively portray that particular block of type. Sometimes that image may be a double page spread (artwork that spans two pages) or one or a series of smaller, spot illustrations. When I have done that, I count up my breaks and see how many pages I have divided the text into, and then go over it again with an eye to eliminating or adding breaks until it divides up into the required number of pages. Remember that there are pages known as preliminaries (title page, copyright and ISBN page, etc.) that are also included in this total, so the actual number of pages of art will likely be less. At times I will receive a manuscript with page breaks indicated (and even art suggestions). These I generally eliminate before starting this process as I don't want to be influenced ahead of time with other people's ideas. I strongly believe that the division of the story should be the illustrator's prerogative. A good writer will have written with those visual breaks in mind and a good illustrator should easily be able to identify them by viewing the raw text. The only exception to this is if the author has imparted VERY important information that needs to be conveyed visually but isn't included in the text. Whenever I begin a story, I always spend a little time doing some character sketches for the main characters. As I work fairly impetuously, often those characters come out whole cloth. Others I work through a bit more until I've got what I want. This is a very important process and you should spend as much time as it takes at the beginning to make sure that you are comfortable with your characters. Be sure to know them in a number of different guises - surprised, angry, sad. Even in attitudes that aren't necessarily going to be used in the story, as this will help you to more fully inhabit the character and make it three dimensional (character-wise) when it comes to working on pages. 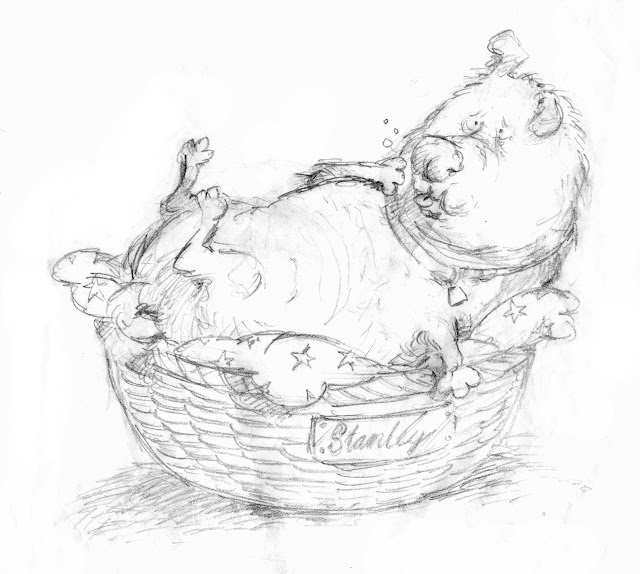 Here was my first attempt at Stanley when I was working on the first Stanley book, Stanley's Party, written by Linda Bailey. The publishers thought he looked a bit like - well - a pig. So I took another shot at Stanley and came up with this. 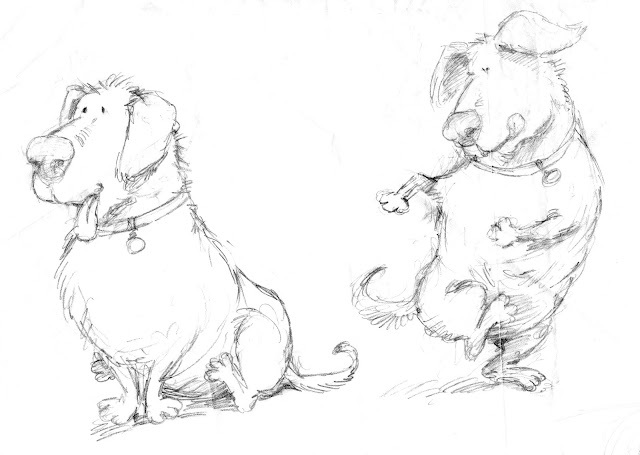 And then explored him in a few other poses as well - for instance, could I make this dog dance? 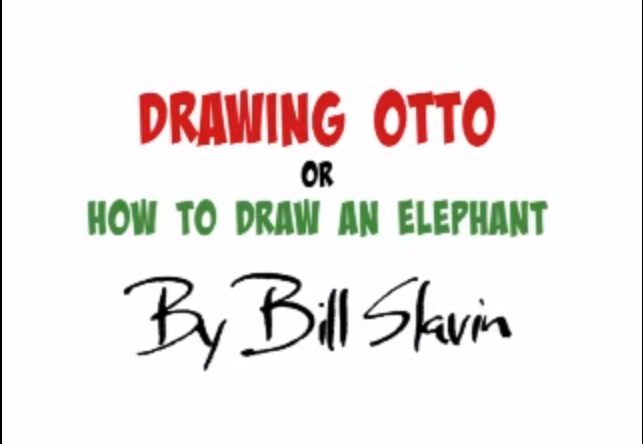 For me the thumbnail process is the most creative part of the process. In a few quick drawings executed over a day or two I capture the essence of the story that will be found in the finished book. In these small little sketches (also known as storyboarding) I portray text placement, point of view, lights, darks, etc. If the action on this particular spread is going to be conveyed in spot illustrations or double page artwork that spans from side to side - all of that will be determined at this stage. 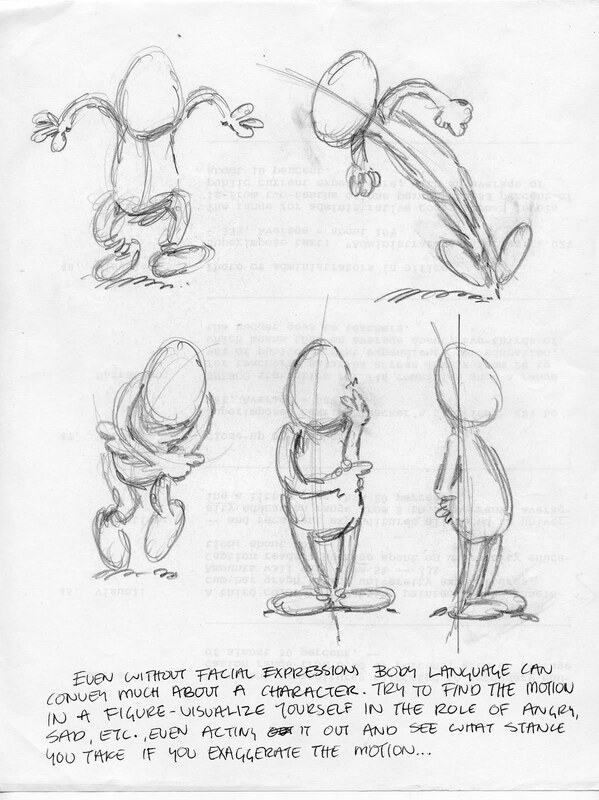 I find the thumbnail process invaluable in character development, too. At this stage, unburdened yet with the encumbrances of detail, one can often capture with a few quick lines a facial or body expression that can serve as a valuable reference when you come to final pencils. Don't labour over character at this point, but equally, don't move on to the next page until the current one has captured the essence of expression that you desire. I will often submit my thumbnails to my editor to look over, urging them not to be too critical of the details as they are undeveloped at this time, but rather as to whether the feel and flow and breakdown of the text is working for them. 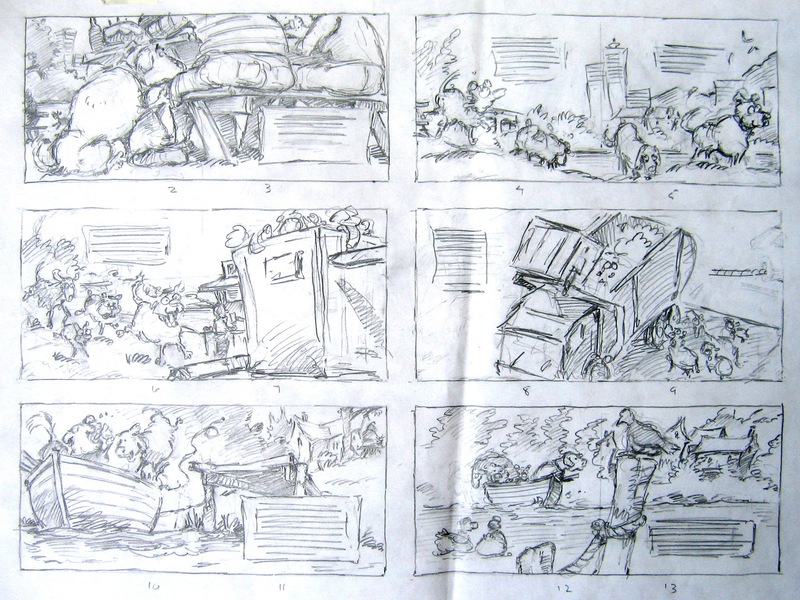 These are thumbnails for the first six spreads of Stanley at Sea. And this is the sixth spread, seen approximately its actual size. 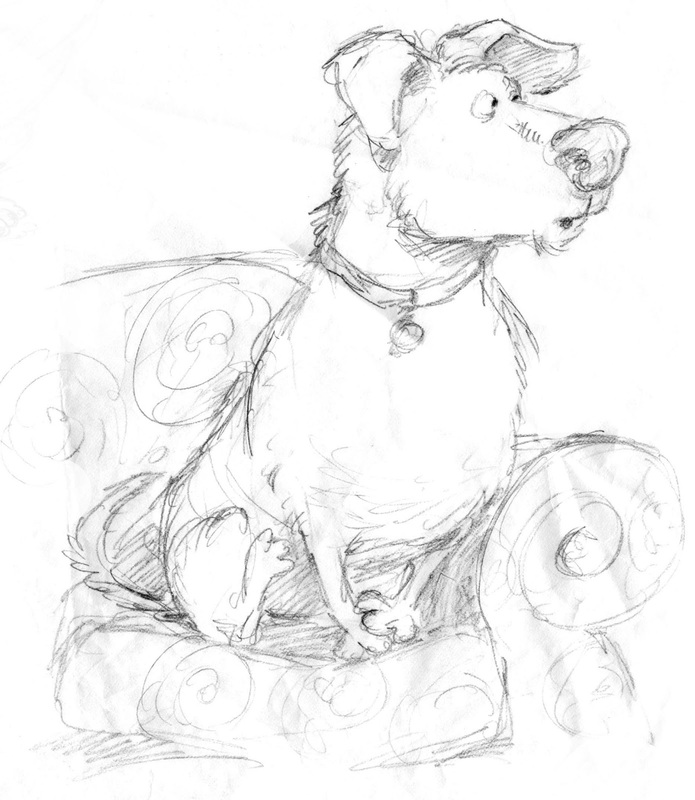 Compare it with the pencil rough below. 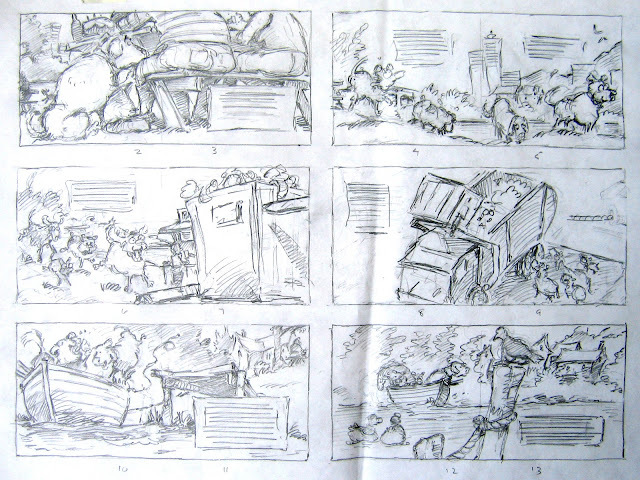 Having created thumbnails and roughs I then move on to the double page spreads drawn at full size as finished pencil roughs. I work with my thumbnails beside me because the essence of what I want to convey is usually found there – things like composition, point of view, character action, lights and darks, text placement etc. These pencil drawings will be fairly tight as I will work directly from them when I execute final art. These drawings are always submitted to the publisher (and sometimes, but not always, to the author) for comment and feedback, before proceeding to final art. This is the same spread, executed as a pencil rough. Note how in essence it resembles the thumbnail above. I have also attached text here to see how that placement will work in conjunction with the art. With picture book illustration it is always important to consider the text within the context of the page and how it works as a separate but important graphic element. Although the preliminary stages of book design are relatively similar for most illustrators, the creation of final art is as individual as the artists themselves. I have done final art in ink, ink and watercolour, pencil crayon, watercolour alone, graphite and acrylics, but most of my picture book illustration is executed in acrylics. Below is my own process that I follow. Final art is created on gessoed paper, usually a four ply bristol. I spread the gesso (a thick acrylic medium used in the preparation for acrylic painting) over the entire paper, texturing it heavily with a big brush. I utilize this texture extensively in creating my final art. I use an ancient overhead projection device (an Artograph) to project my pencil drawing onto the gessoed paper, and employ India ink with a brush to create a heavy line that will be used to do my final painting. Because my line work tends to inform my art to a great extent, much of that line will still show in the final. Artwork transferred as line on to gessoed paper. I generally work form dark to light, beginning by covering my entire paper in a dark wash, usually of burnt umber and dioxozine purple. My line still shows through this wash. Then I block in the underpainting. Background painting with water and sky blocked in with base colour. The next part of the process involves overpainting with lighter colours and dry brush and working up the details. Trees, water and part of sky worked up, although I have yet to bring in any washes, which I usually do later. I try to do the background first and the foreground and characters towards the end. I use a combination of dry brush techniques and washes, utilizing the gessoed texture, to give my paintings their unique final appearance. 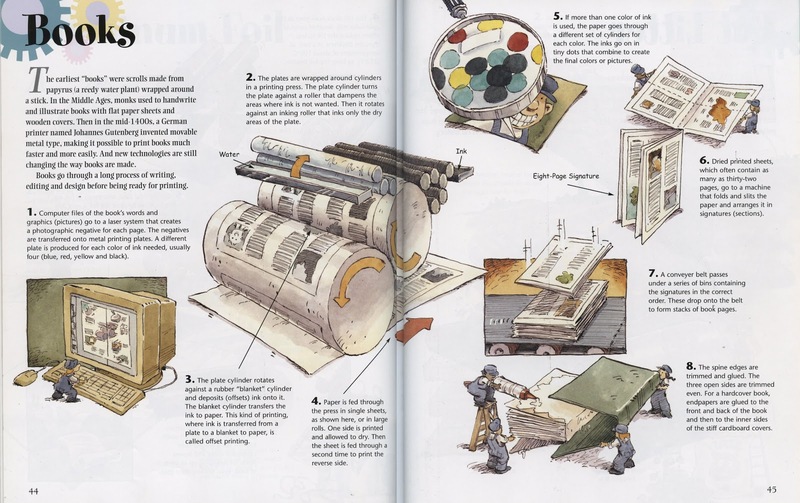 The final art as it appears in the book, with text in place.